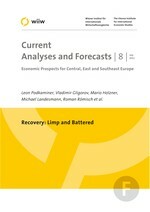 In Slovenia, GDP which is driven primarily by foreign demand will grow by 2% in 2011. The enterprise sector is currently facing liquidity problems and needs to deleverage, thus there is little room for investments. Somewhat faster growth can only be expected in the years to come, as long as investment enjoys a recovery and private consumption registers some improvement. For the latter to happen, however, the labour market will have to improve as well. Given the ongoing fiscal consolidation, public investment will need time to recover. Solving the political problems will be one of the main prerequisites for a return to a sustainable growth path.